Flash sale today – will post at 3pm this afternoon our fab sale items and the sale runs until midnight tomorrow. Some of our art which we are reducing (in a big way) is one off’s so you will need to get in there quick. Also you can’t buy these deals via the web its a call or email to the store I hate to say but will post all those details on the blog at 3 this afternoon. Also my mini series of master classes are going ahead I am delighted to say, we are just juggling around my schedule as we speak and as soon as we get a few of my appointments re scheduled I will post all the dates and details. Classes are small and intimate since they are held in my house (and its not huge) so book early. Down to business letâs talk if you don’t mind about finishing touches the equivalent to the 5-minute face lift. Finishing touches sometimes get a little neglected as I think often times we tend to stop decorating too soon. 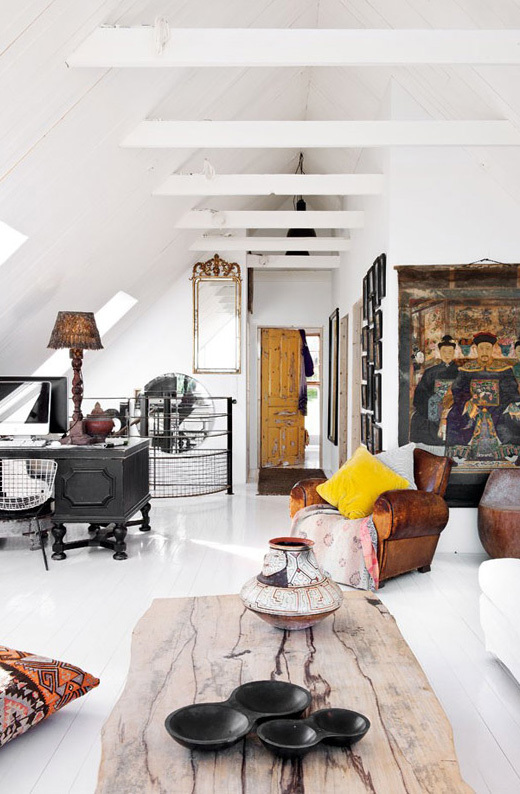 Yet its the details that actually turn a room into something jaw droppingly amazing – a hand full of cushions on a sofa for instance, a collection of art on the wall, personal stuff that gives a room its personality. I know that sometimes people are afraid of their homes looking too cluttered and too crazy and so pull back or the dust issue crops up – can’t even recall how many people have said to me in the past your house must be a nightmare to dust! Who cares would I rather live in some minimal abode with nothing on shelves or walls? Nope a little bit of dusting won’t kill me, yes I do have a cleaner but often times by the time its the weekend things need a sweep or dust and I like it. Pottering around with radio 4 in the background, more like creeping I should say with the duster concealed under my jumper until its time to whip it outÂ (its Maud’s favourite object and one that she is on a mission to pull apart and if she gets a glimpse all hell breaks out – which is why her school day is the same day that the lovely Inga comes to clean). Anyways I digress these 5 minute quick fixes add interesting layers to rooms – just remember to mix up the textures (rough, smooth, shiny, slubby), as well as the scale, big pieces next to teeny tiny pieces and suddenly you will have on your hands a home that you never want to leave. 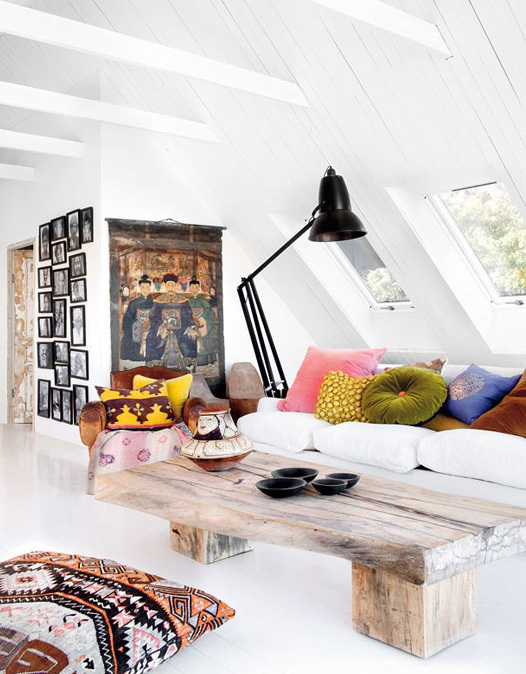 Can you imagine how different this space would look if it was devoid of stuff – the cushions tantalise us with their different textures and patterns. The art adds a whole other dimension I don’t quite know what to check out first the large painting or the collection of little ones of the wall nearby. Marie’s played with scale plonking a super sized light over a low slung sofa (perfect) and really mixed up the materials. A rough hewn coffee table on a super sleek floor, an old worn leather club chair brought alive by some contrasting cushions. And it doesn’t stop there – another angle of the same rooms shows modern finds partnering vintage finds (check out Marie’s desk) along with a sweet collection of mirrors and more art. It takes us on a journey none of these finds have been brought from one single place hence the intrigue and its a place that looks and feels as if they owners travel even if they don’t its got that global eclectic vibe going on which when you break it down and think about it is actually pretty easy to achieve right? 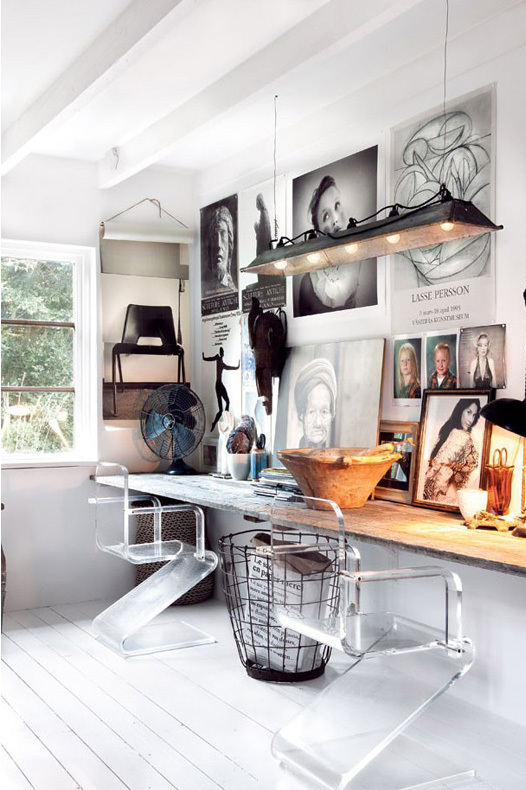 Love the desk, the lamp, the chairs – why should an office look like an office especially if it happens to be at home. Beautiful.